A bakery producing hamburger buns for a major fast-food restaurant was using air atomizing nozzles to apply egg wash to the top of buns before baking. The system clogged frequently and required shutdowns every three hours for maintenance. In addition, misting from the nozzles resulted in worker safety issues and additional cleaning time to remove the egg wash from equipment. An AccuCoat® Chilled Egg Wash System is now being used. As pans with buns pass through the spray station, PulsaJet® electrically-actuated hydraulic spray nozzles apply the chilled egg wash. PulsaJet nozzles achieve very low flow rates using larger orifices and provide comparable performance to the air atomizing nozzles used previously, but eliminated the clogging and misting issues. 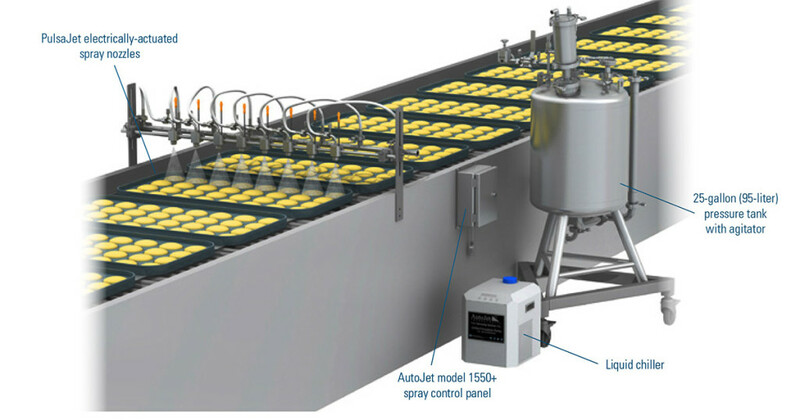 The AutoJet® Model 1550+ spray control panel works in tandem with PulsaJet nozzles to provide Precision Spray Control (PSC). PSC ensures the proper volume of egg wash is supplied even when operating conditions like line speed changes. The egg wash is kept at the proper temperature and consistency through the use of a chiller and agitator in the pressure pot. The bakery has dramatically improved operational efficiency and worker safety with the use of the AccuCoat® Chilled Egg Wash System. By using hydraulic PulsaJet® nozzles instead of air atomizing nozzles, the bakery isn’t faced with clogging and misting issues and maintenance downtime and the associated labor expense have been eliminated. In addition, the work environment no longer poses health risks. The use of Precision Spray Control (PSC) ensures the proper volume of egg wash is applied to each bun with minimal waste. As a result, the bakery is using 50% less egg wash. The annual savings provided by the system is estimated at US$60,000. The bakery recouped the cost of the system in less than one year.